PoPville » Dear PoP: Haydee’s to eat or not to eat? Dear PoP: Haydee’s to eat or not to eat? Haydee’s wanted the creation of a loading zone in front on their restaurant on Mt P Street. This would eliminate the loading zone on the western corner of Irving Street and move the bus stop to the other side of the block. The ANC did not necessarily see this as a bad idea but wanted to “move ahead cautiously” to make sure the neighboring businesses were aware and OK with this change. A couple of other neighborhood organizations agreed with this approach. However, Haydee and Mario, the proprietors, felt gravely insulted that they couldn’t get what they wanted right away (and thus the shouting match at the ANC meeting). After all, as seen in the past, anyone standing in their way has been deemed anti-Latino business. The zoning committee obviously had to be anti-Latino when rejected the outdoor seating request. It had nothing to do with the required 10-foot clearance ordinance, but was of course clear racism according to Haydee (of course to accept this conclusion forget about Don Juan’s outdoor seating). I believe this issue is no longer about just a loading zone. Personally, I think it’s a good idea and more businesses on this stretch would benefit for the relocation. The issue is the way Haydee thinks she can behave, avoiding legal means to achieve her goals, and throwing out the race card to anyone standing in her way. 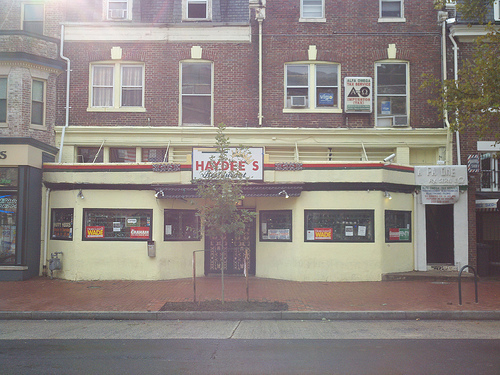 We judged Haydee’s, located at 3102 Mount Pleasant Street, NW, back in March ’09. Previously controversy erupted over the removal of a tree out front, which resulted in a new tree being planted. Haydee’s has also been the host to numerous fundraisers for those in need. Construction to finally Begin on Boundary Stone Bar in Bloomingdale?